Cucumber is one common vegetable crops in home gardens of the Russians. However, to grow a rich harvest of cucumbers not at all impossible. In this issue there are nuances. Always water the cucumbers only warm water. During flowering and fruiting it is necessary to do very often, but without fanaticism, otherwise you will flood their green Pets. The lack of water will inhibit the formation of their fruits and increase their content of substances that are responsible for bitter taste. 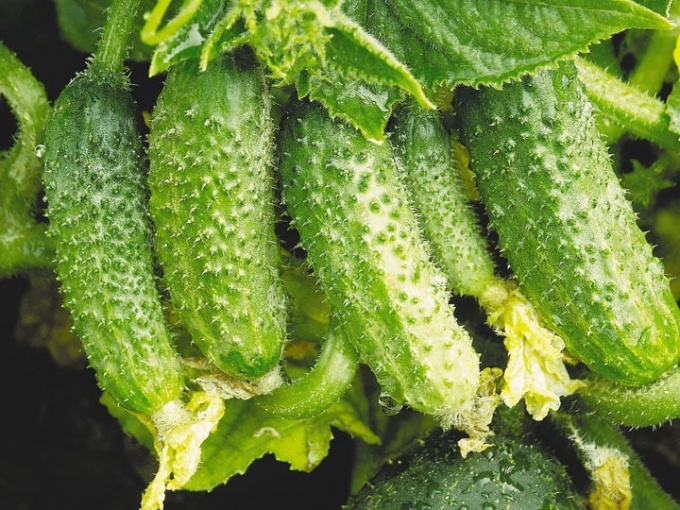 In very hot weather, the cucumbers should be watered twice - morning and evening, when subsides scorching heat. Otherwise rich harvest you can not see. Cucumbers always water directly at the root of that as little as possible of water falling on the leaves. Otherwise you can easily cause the appearance of powdery mildew. Every time after rain or irrigation do not be lazy to loosen the top layer of soil when it dries out a little. Due to such concerns, the plant's roots will get enough oxygen and cucumbers will grow faster. Presidnete cucumbers, when finally formed the fifth piece. It is better to make a cut with a sharp knife. This will give impetus to the development of side shoots. Put on the beds with cucumbers kohlrabi cabbage or iceberg lettuce. These plants will effectively protect cucumber plants from strong winds, which they don't like. Pronunciate the beds with cucumbers manure or humus. Quite enough to layer with a thickness of three to five inches. As often as possible spray the cucumbers, especially in the heat, but only warm water. They are for such a procedure will answer you in good yield. Heat is disastrous for cucumbers. It has a negative impact on the fruit and may cause the increased appearance of male flowers, which are not able to harvest. During the growing season once in 10-15 days, fertilize cucumber special fertilizer to improve their development and growth. However, it is come, and the usual urea - 1 teaspoon in a bucket of water. Pick the cucumbers as often as possible, do not let them periostat. First, developed into the form they are not so delicious, and second, without removing the existing cucumber, the new form will not.